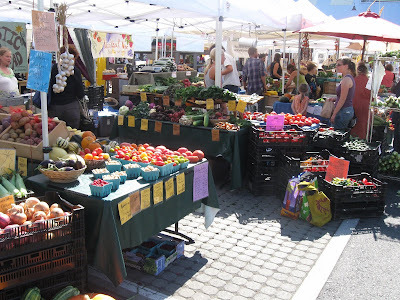 Lots of healthy looking produce at Bellingham Farmer's Market which was also part of the Farm Tour on September 12. After the rally for health care reform and then stopping by the market for a snack, I biked out to some county farms that were participating in the farm tour. Only had time to visit Silver Springs Creamery and Bellwood Acres apple farm. They were near one another south of Lynden. Many folks were driving to hit all the farms on the tour. Uses a bit of gas. I focused on two and arrived by bicycle. Sampled ice cream and fresh milk. Tasted apple slices. Weather was spectacular that day with Mount Baker shining. Hope most of the people moving to Whatcom County like living in dense urban environments. That way, we can keep the sprawl contained and preserve farmland.